It’s been 5 weeks since I broke my 5th metatarsal. As I’ve mentioned in recent posts, I’m extremely limited at the moment: I can’t walk or drive, and it’s been very challenging to say the least; ultra-marathoner to crutcher is not a transition I ever wished for. When I got hurt, I had two choices: I could wallow in despair, lamenting the loss of my fitness and goals for the season, or I could do everything in my power to preserve the base I’ve worked so hard to build, hoping for a swift recovery. I chose the latter. Diet: Hands down, the top reason why I haven’t gained a lot of weight. I’ve drastically cut my caloric intake to compensate for my sedentary state, and in turn, my body is craving fewer calories. It was particularly rough for the first 7-10 days – I had just come off a 10 day stretch where I biked almost 300 miles, not counting the additional swimming and biking, but it’s become progressively easier since then. I eat to my hunger and cut down on snacking – in large part because it’s not easy to get up and grab something from the kitchen. 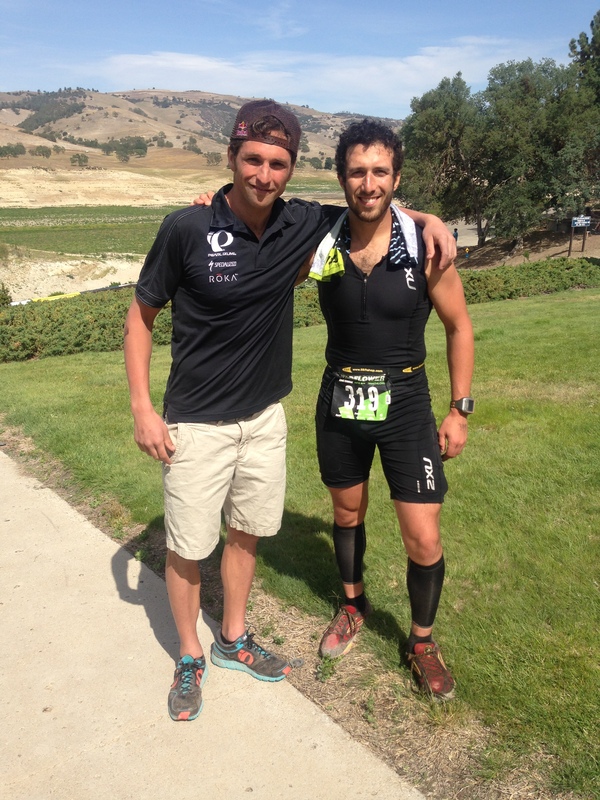 Jesse Thomas and I after Wildflower 2014 – a true role model for triathletes with broken feet! Core/resistance work: When I first got hurt, I watched some Youtube videos for workout inspiration – the exercises aren’t earth shattering or innovative, but they do enough. I’ve tried to adapt the triathlon-specific weight lifting and core work to whatever I can manage at our apartment with limited equipment. This has translated to a lot of pushups, stability ball crunches, resistance bands, and medicine ball exercises. Between using crutches and the aforementioned workouts, I actually think that I’ve added upper body muscle mass since the injury. Swimming: Ah, swimming. Swimming is the primary semblance of normalcy I have right now, and I look forward to every swim. It not only kickstarts my brain, but allows me to pick up where I left off so to speak; I’ve had some quality swims this week and feel noticeably stronger than when I first got back into the pool last week. The keys to swimming when you can’t are using the pool lift and a pull buoy. You also need to exercise extreme caution on the pool deck, as a fall could take you back to square 1. The lift allows me to safely enter and exit the pool without risking a fall or impact from jumping in. Although it’s expensive – I have to take an Uber to/from the pool each time I go, it’s a small price to pay for my health right now. The moment of truth comes next week: the doctor is expecting to see substantial signs of healing by the 6-8 week mark. If my appointment goes well, there’s a good chance that I’ll be cleared to bike indoors (using stiff, carbon-soled shoes) and possibly walk. If it doesn’t go well, then we’ll have to reopen the conversation about surgery, which would effectively shorten my season to September-December – best case. Surgery would be utterly devastating and awful given the amount of time I’ve already spent on the sidelines, but if that does happen, at least I know some tricks for staying fit. Keep on keeping on.. you’re doing great. It’s so difficult for endurance athletes to be injured, and you’re doing it with a major dose of grace! Thanks! Let’s see what happens on Friday – a return to walking or cycling would be a big boost! I’ve been wondering how your recovery has been going. Diet definitely is essential and I have been on the good side of that and done the wrong stuff before too. Not always easy at first but as you said, it can be done with some diligence. Fingers crossed for good news. I do like your swimming spot though! Thanks for thinking of me Sarah – I appreciate the kind words. Bay Club is awesome – no doubt about it, and I’m grateful that I can swim. I love seeing your jawbone stats – you’ve been super consistent, and you’ve been logging some awesome runs. Keep on shredding! Good luck. Hope it’s good news soon. Keep the faith. Thanks Jim! I hope you have a great weekend. Thanks man… I’ll be dodging snowflakes. Here’s to hoping that next week is good news and you can get back to training! Nice work staying on top of things while sidelined though, I admit I would have problems focusing like that. Thanks Fallon – I hope so too! I appreciate the kind words – the workouts I’ve been doing recently are a far cry from where I was before the injury, but they’re better than nothing! Thanks Kerrie! One day at a time! I wallowed for a while (bulging disc), but now that I can walk in the water, I am on my way back. It’s SO HARD to be injured! 😦 So glad I didn’t sign up for the first tri of the season in 4 weeks–I could do it, but it wouldn’t be pretty. Keep healing, keep that positive attitude, and please, keep spreading the happy. We all need it out here!!! I’m so glad to hear that you’re on the mend. You’re spot on: being injured is so challenging – both mentally and physically. Good for you – the races will be there, and your health is the priority. Here’s to a swift recovery! Thanks Leslie! I completely agree – biking will be a huge boost, and I’m ok with tabling the running for a couple more months. You would be proud – I swam 10k yesterday 🙂 Hope you’re having a great weekend! Good luck on your appointment! I tore a ligament in my ankle a few years back and I took the sedentary/wallowing approach. It truly did me no good. It’s great that you’re embracing what you can do. I did the same thing when I tore my rotator cuff a few years back; that was my first serious injury. I was kicking myself when I started to get back into it – something is better than nothing, and I’ve found that the same holds when I’m not super motivated to work out. Thanks for reading! I appreciate the kind words. Good luck! It’s been four months since I hurt my hamstring and I’m still not 100%. Though I can run, I can’t do longer then 8-10k on the TM and running outside isn’t an option (we still have snow and icy trails/sidewalks). Thanks! I’m sorry to hear that you’re still recovering – use this time to focus on what’s in your control. From a timing standpoint, it’s always inconvenient, but hopefully you’ll get to make the most of the warm(er) weather soon. I am so impressed with your commitment to fitness and hopeful that you will recover soon. You inspire me. Thanks Taline! I’m feeling better every day, and swam a 10k over the weekend; I’m hoping for some good news on Friday! I’m sorry this is still such a pain for you, but thank you so much for sharing what you’re doing with the rest of us. I’m struggling right now with training and have taken a step back from running despite being 3 weeks out from a marathon due to a lot of pain and I’m trying my best to keep my fitness up in any way that I can. Keep on with that healing, Jesse!! Oh no – I’m sorry to hear that. Do you have access to a pool? Swimming/pool running could be a good option in the short term. Stay positive – it will pass! Take care of yourself! Good luck Jesse, hang in there! 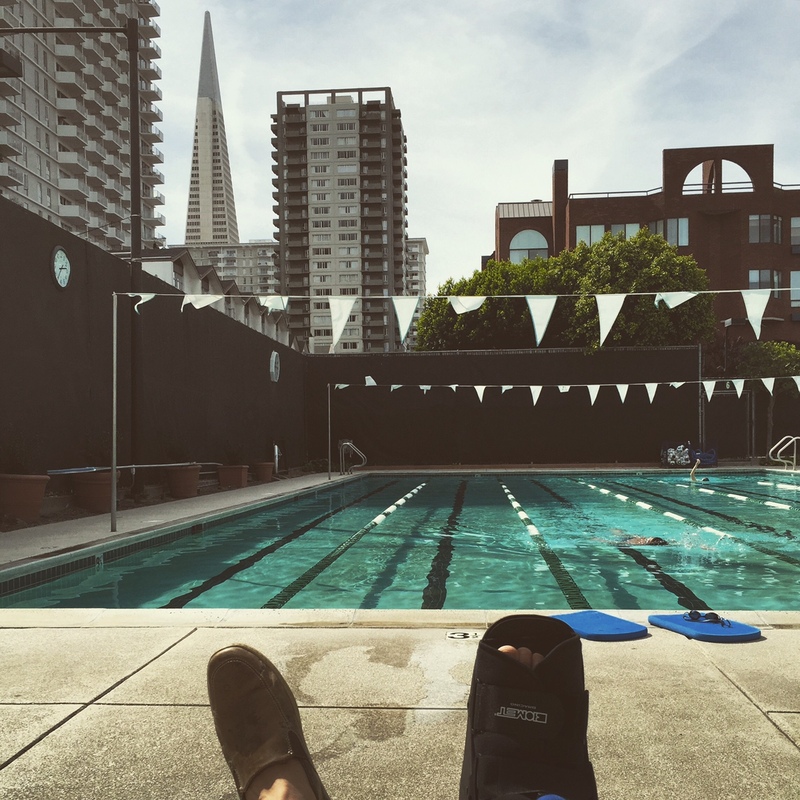 And here’s a fifth metatarsal fracture survivor – I am not alone! Read how she examines the alternatives to weight-bearing exercise. It is so hard to stay motivated, actually some days to even move. Thank you for some inspiration! There is one thing that I didn’t see you mention when referring to water. Aqua jogger http://www.aquajogger.com/ it is a belt (and other accessories) so that running in the weightless environment of watet is possible. This system has saved me… although I can’t use it at the moment. But for the last 10 years this was and is the only way that I can run. Best if luck on your recovery.